Just in case you haven’t yet signed up for my newsletter I thought I’d share this one with you. It includes the “Winter 2012 Offer” currently underway on the website. While you are there be sure to browse around the newly update site and see what’s new. You don’t want to miss out on news like this, be sure to click the link on the bottom of any of the website pages to sign up. I hope that your 2011 was a wonderful one and you are looking forward to what 2012 holds in store. I love the possibilities that a fresh new year offers! The only part of the new year that I’m not fond of is getting through the winter weather, lack of daylight and those long, cold nights. Do you feel the same way? It seems like being indoors for the bulk of my day makes me look for bits of sunshine & happiness in whatever room I happen to occupy at the time. Of course you know where I often find it, don’t you? Yup – ART! I’ve been blessed to trade, barter and purchase pieces from many artists so that my walls are full of interesting, colorful art that help to chase around the doldrums of winter. I’d like to help you chase away your winter blues as well! I’ve got a special offer for January & February with discounts on my art as well as a special “adoptable art” area for some special pieces that need a good home. Click here to visit the “Winter 2012 Offer” page and then call or email me so we can arrange to get some art into your home or office an banish that winter state of mind. Digital art can take many forms from artwork “painted” entirely by digital means, to fractal art (based on mathematical algohrythms), photo-based images that have been altered by digital means and also digital collage that combines these creative methods with photos, clip art, text and other images. I’ve been creating digital art for almost 10 years and have files full of images on my computer that rarely are seen. To give them a bit of “life” outside of a file folder I’ve started this new blog that will have a digital art image posted to it each day. I hope to expand the blog to include images and information about other digital artists as well. Click on the image above to visit the new blog and get a quick digital art fix for the day! This year I have two solo art shows scheduled that will focus on my digital art. I will be coordinating a digital art show in August in conjunction with my solo show at Sugar Creek Art Center so I anticipate spending a lot of time with pixels! 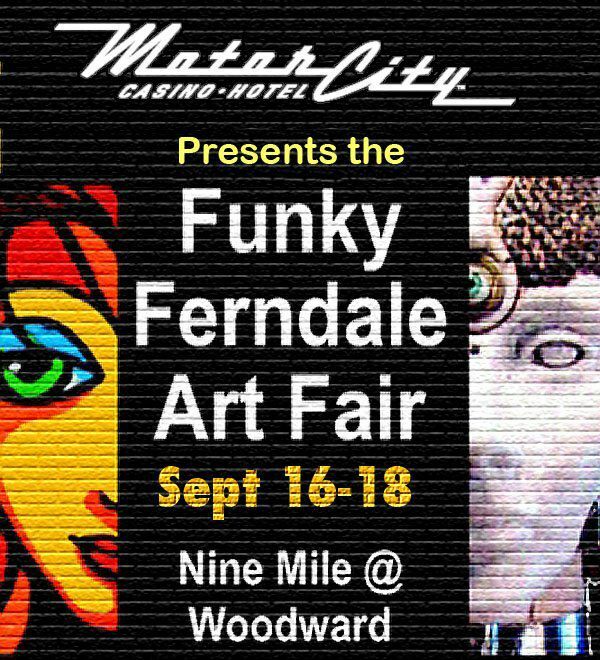 If you wonder what I’ve been doing lately, I’ve been spending lots of time gearing up for this show in Ferndale, Michigan! I plan to having over 50 mandalas and mandala inspired art pieces in my booth for this three day show. I’ll be in booth #123 – pop in and say hello while you are browsing the funky treasures! I know I posted info about this show a few weeks ago and have mentioned it in a few recent posts but I wanted to give your memory one last “jog” before the weekend! I’ll be setting up my booth this afternoon and ready to go Saturday morning at 10 a.m. Just so you know, I’m packing a few new creations that haven’t even been shown on the blog or the website yet! Come take a peek, say hello and get a little pre-holiday shopping done while you support the local art community. Recently I posted images of new digital “texture art” that I created using photos of rocks/nature combined with the texture/colors of some printmaking details. (You can see those HERE and HERE!) In those posts I mentioned that I had sent some of the images to be printed on aluminum. They turned out beautiful & shiny! I debated how best to show them and thought of combining them with a wall sculpture of some sort. When Mark & I were making art for the recycled art show I brought them out to the shop and played around with several ideas, none of which really excited me. Then Mark suggested we use some stamped scrap metal to create “frames” for a couple of the prints. Perfect! It’s so nice to have someone to bounce ideas off of and work together creatively! We ended up framing two of them like this, I am considering do a “float” type of display on some of the others. 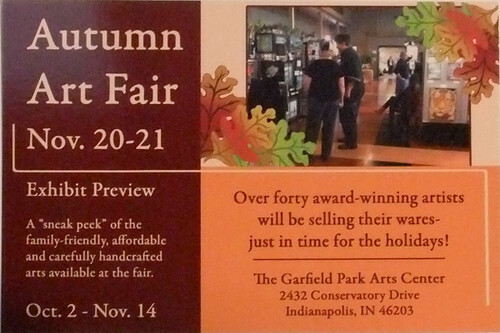 I will have them on display at the upcoming Autumn Art Fair at the Garfield Park Art Center on November 20th & 21st. Be sure and mark your calendar and come see all the wonderful art that weekend. It would be a wonderful place to pick up one-of-a-kind gifts for the holidays and support the local art community! Mark & I have been creating artwork together to show this weekend at the “Deja Vu All Over Again” show in Columbus, Indiana (click here for more info). 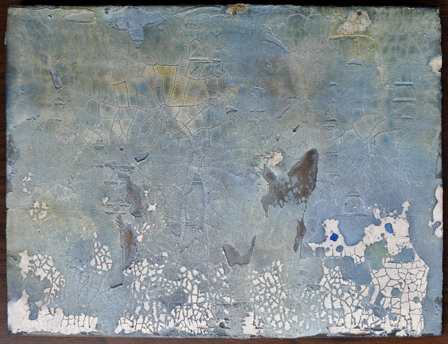 This is one of the first completed pieces – there are several others that are close to completion or in the “drying” stages. It’s been fun to work together & brainstorm a bit! 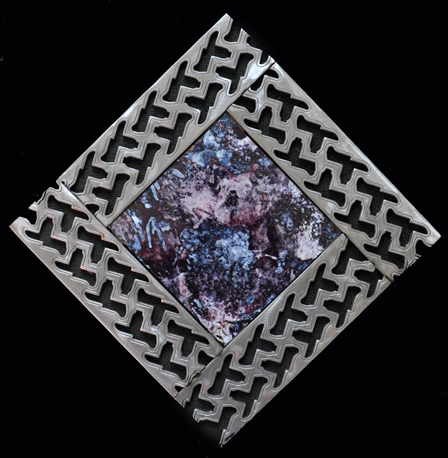 I have been having a lot of fun with cement, grout & sand mixtures added to wood for texture and interest so I wanted to incorporate something like that into a few of the pieces we made together. This was a piece of scrap wood from my father-in-laws barn, I have no idea how long it had been out there but it was a great piece to “recycle” into some new art. 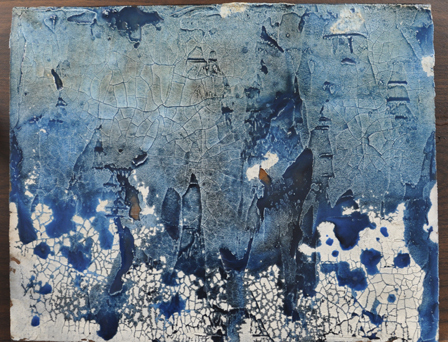 Since I’ve been enjoying the texture on wood I had purchased some “crackle” paste a few weeks ago that I hadn’t played with – this seemed to be the perfect piece to give it a try on! After I applied a thin coat it had to dry for several days before I could add anything to it. 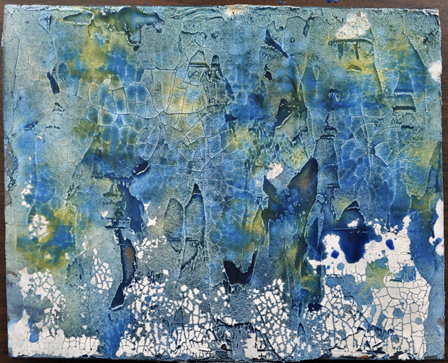 I sealed it and then began to use washes of acrylic, using both liquid acrylics and acrylic inks. After applying them I sprayed water to thin them further and let them drip/run around the wood and into the cracks on the surface. Using the thinned paint is a bit deceiving because it looks quite bright but, since it’s such a thin layer, it dries in a much more muted tone. 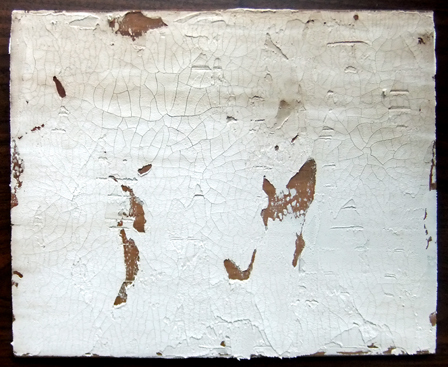 This is how it looked after the first two layers (shown above) dried. What a difference! I ended up going back and adding another (slightly thicker!) layer or two of color before I was satisfied with the saturation. The metal “frame” for the piece was welded from old parts that we keep in stock out in the workshop. It’s always fun to dig around and pull pieces out, arrange them, switch them and get them “just right” for whatever project we are working on. When we first started making metal artwork together we painted all the pieces in bright colors, lately if we do anything at all to them it’s just buff them to a shine & seal them with clear paint. For this piece the metal was left in it’s natural, semi-rust state since I wanted to give an old, weathered looked to the entire piece. I added the three accent pieces to the wood after it was dried & re-sealed. It’s new enough it’s not even been given a name yet but I wanted to give you a little preview of what we’ll be showing this weekend. PRESS RELEASE: Broken toys, yesterday’s newspaper, and china shards may seem like trash to most, but in the hands of professionals, they can be transformed into beautiful art and fine crafts. On Saturday, November 6, those in the Columbus area will see such work when they attend the sixth annual Déjà Vu All Over Again Art Show. Held at Yes Cinema and Conference Center located at 4th and Jackson Streets in downtown Columbus, Indiana, the show will run from 10:00 a.m. until 4:00 p.m. Twenty-three artists from throughout the state were invited to display their work, which includes collage, mosaics, assemblage, jewelry, metal sculpture, furniture, leather goods, woodworking, and fiber arts. Some of the more unusual entries are those of Bloomington artists Nick McGill and Susie Seligman. Reusing old machine parts, McGill transforms them into unusual candlesticks, and Seligman turns auction and flea market finds into whimsical chairs and sofas. Other Bloomington artists include Martina Celerin showing her spectacular weavings and Cappi Phillips who will display fanciful mosaics. 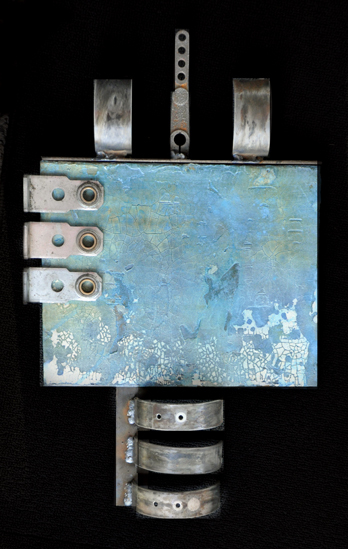 Popular artist and metal sculptor Glenn Carter is returning for his sixth show. Many who have toured the “Back Roads of Brown County” will recognize Chris Gustin’s rag rugs, and first time exhibitor Talia Halliday, of Bloomington, will display handmade journals created from old hardback books. Also new this year are Nashville mixed media artist Tim Carter-East, jewelry artist Ann Johnson of Muncie, and Anita Hopper of Indianapolis. Hopper repurposes old leather goods to make stylish clutch purses and handbags. Bloomington artists Mary Hambly will display intricately designed Paper Art Quilts, and Ruth Rives will show felted purses. Other new participants include Columbus residents Larry Brackney, who creates assemblage, jeweler Martha Butler, woodturner Bill Griffith, and fiber artist Sophie Callaghan Miller. Showing jewelry made of vintage buttons is Maggie Dixon of Elizabethtown. Some returning artists are Edinburgh jewelry artist Lori Henderson, Columbus’ Marilyn Brackney, who will show found art dolls, and the husband/wife team of Mark and Lynne Medsker of Brownsburg. 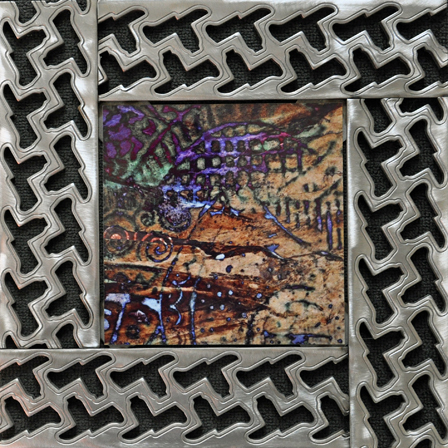 Mark is a metal sculptor, and Lynne uses mixed media to create collages. Also back to display their work are Columbus woodturner Chad Shock and jewelry artist Jill Stillwell. 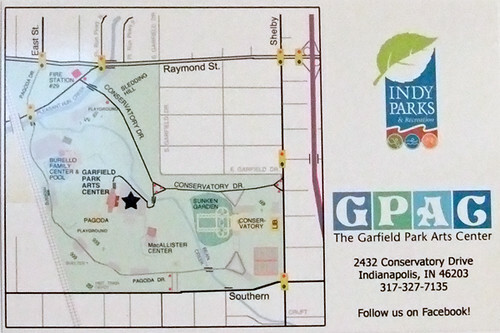 Sponsored by the Bartholomew County Solid Waste Management District, Columbus Area Arts Council, Columbus Indiana Visitors Center, Pentzer Printing, and YES Cinema, this free event is held in celebration of America Recycles Day. All the art and fine crafts were created using scrap or repurposing items most people throw away. The show’s sponsors hope to demonstrate that such work is just as interesting and equal in quality to that made of new materials. In fact, recycled art is becoming collectible, and it’s often exhibited in fine galleries and shows across the nation. In addition to the art show, the Bartholomew Consolidated School Foundation is sponsoring a Shred-a-Thon from 11:00 a.m. until 3:00 p.m. Speedy Shred, a local document disposal company, will provide shredding boxes for papers and security certificates for those wishing to use the service. A donation of $5 per container is requested, and participants may bring up to two, legal-sized boxes of documents. Also, Bartholmew County residents attending the event may trade as many as five, 60 or 100-watt light bulbs for the equivalent in CFL bulbs. Local school students who received a grant for their service-learning project from State Farm will manage the exchange. To learn more about Déjà Vu, visit http://kid-at-art.com/htdoc/dejavu10.html.